You may be deciding whether to add vegan clothes and shoes to your lifestyle change, and I certainly applaud you taking the time to think it over. While many people come to a plant-based diet solely for the health benefits, after time, many of those people realize that using animals for food and clothing is not ethical. Most people evolve into choosing vegan clothing rather than completely throwing everything they used to own out and buying new stuff right away. When you start looking for leather, wool, and other animal products in your clothes, are there any options left? I hope this will serve as a guide to help you find cruelty-free clothing. As with buying vegan food, when you search for vegan clothing, you need to get good at reading labels, which can either be on the back of the neck or the inside side seam for a shirt, and typically on the inside back label in pants. I commonly have people say, "Why can't you wear wool? It doesn't kill an animal to cut it off." I understand where people are coming from with this question; it's a place of curiosity with a tinge of outrage at our vegan extremism. But, if you disect the reasons behind not wearing wool, it comes down to the same fundamental argument that we make for all animal products. Many vegans simply believe that animals should not be exploited by humans, and that using any part of their body uses that animal for our own benefit. Wool-bearing sheep are actually raised on the same types of factory farms as the cows, pigs, and chickens that we know so much about. Just like with the other animals, they are keep in overcrowded spaces, and experience the following without anesthesia: castration, tail docking, ear-hole punching, and the cutting of skin for Merino sheep (keep reading). When lambs are shorn for wool, it isn't the haircut we're taught about as children. They are bred to constantly produce fur, and that fur is shorn on different schedules from the natural production cycle. So, their fur is cut off when it's cold, and often it grows back when it's warm outside, causing death from both heat and cold. Additionally, if you actually watch the process by which sheep are shorn of their fur, you would likely be outraged. The sheeps are clearly terrified; they are pinned down in a painful position, little care is taken to avoid them being hurt. For those beautiful Merino Wool pea coats, hats, and scarves that we love so much, Merino sheep are used. In addition to having thick coats of fur, Merino sheep are born with more folds of skin than regular sheep. In between those wrinkles, there are often flies laying eggs. Factory farmers have tried to prevent the fly infestation by simply cutting those wrinkles off the sheep, trying to make their skin lay flatter. All of the animals used for their furs and skins are treated in similarly disgusting ways. Definitely look for vegan clothes without wool. When you tell someone you don't buy vegan clothes with silk, you often get the same curious stare as for the wool question. It again seems so extremist, "Why do you care about worms? Doesn't the silk just come out of them naturally?" Well, yes, it does, but we've now turned that natural silk producing worm into a worker as well. In the wild, silk worms would produce their silk within about three days, and then would leave its cocoon and the silk string would be cut off. Silk producers instead kill the worms before they leave the cocoon by heating them in an oven or steaming them. Vegans again just don't believe in using animals, and silk production is another way of using animals. There is an entire industry dedicated to the production of leather, and it doesn't care at all about the well-being of its animals. A great video to watch on the subject is EARTHLINGS, which features the leather industry in India, and how to cows are herded and treated and then killed in order to give their skin up for everything leather we wear. It's excruciating to watch and will likely convince you forever that it's simply not worth the fashion statement to have that pain on your conscience. 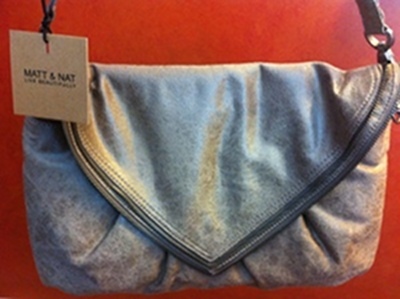 If you're looking for a great vegan handbag, check out Matt & Nat. It's one of my favorite companies and their bags are gorgeous. Other high-end brands include Crystalyn Kae, CoraLei, Cri de Couer, and Pansy Maiden. As far as non-leather shoes for women, the brands seems to expand daily, but a few of the big names are Beyond Skin, Cri de Couer, Siobhan, Mei Shoes, Neuaura, Olsenhaus, and Big Buddha. What's even cooler is that there are now amazing vegan shoes for men, including dress shoes for preppy men made by Vegetarian Shoes, Novacas, and Veganwares, as well as plenty of casual brands. I've watched a ton of recordings of real life agriculture and clothing farming and find most of it intolerable. One of the worst still images that I will simply never get out of my head comes from a fur video in which a small fox-like animal is being stripped of his skin while still alive. He looks directly at the camera in searing pain with a look on his face that seems to say, "why?" and "please help" at the same time. He looks like one of my dogs and I can't bear to think of how many of these poor animals are making this face this instant. Even thinking about it right now makes me want to cry, puke, and scream all at once. Those people who proudly wear fur and say they have a choice to wear whatever they want are simply not aware of what goes on in order to get that mink coat on their backs. Even the sickest, cruelest, most evil people in the world could not deal with causing that much pain for a simple fashion statement. Now, felt is a weird one that you might not have expected to find on this list. In most cases, felt is produce by compressing fibers like wool, skin, and fur into hard pieces of fabric. You can find vegan felt, and it will specify that it is made without animal products. When searching for vegan shoes, I always check the materials list on the inside flap of the shoe. Beware the "leather upper" or the "leather lining" or the "suede" tags. Vegan belts require the same commitment. Vegan Essentials has plenty of vegan belts in a variety of styles, anywhere from hemp braided belts to professional-looking belts that will fool everyone at the office. They also have great vegan clothes and food! One of the favorites in eco friendly shoes and vegan footwear is Earth Footwear. They have a special vegan line of earth shoes that I think you'll love. A lot of people ask me where to find high quality vegan hiking boots. We've done a bit of research and come up with your best options here. So, if you've just become vegan, does your decision to be completely animal-free mean you need to go out and get a new wardrobe. Though some might say yes, I firmly believe that this is another area of the lifestyle that you should take at your own pace. It can be expensive to buy all new clothes. You should not feel forced to shred every bit of leather and wool in your closet simply to be legitimately called a vegan. If your collection of animal products in clothing is small, this might be a more manageable task. Many vegans are also environmentalists and believe that buying and trashing clothing is a waste. So, they think it's better to simply stop buying new un-vegan clothing and start donating their old products to charity. I personally can't stand the idea of a pair of leather shoes sitting on top of a landfill when they could be on a less fortunate person's feet. Finding good vegan clothing is easier than ever, and every day it gets better. More and more I see companies coming out with amazing jackets that look like wool, bags that look like leather, and everything in between. I hope this has helped you to learn more about vegan clothes and what materials typically make up regular clothes.